Majahual is a traditional fishing village on the Costa Maya with palm tree-lined beaches and crystal clear waters made for sunbathing and snorkeling. 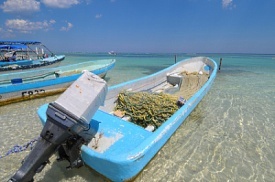 Take a day trip to Punta Herrero, a small village in the Sian Ka'an Biosphere Reserve. Or explore the coastal lagoons and Chinchorro Bank, the world famous atoll located 18 miles offshore.